(Phys.org) —National Museum of Natural History scientist Torsten Dikow discovered and named a new species of assassin fly, Burmapogon bruckschi, after studying the first two specimens ever preserved in Burmese amber. For more than 100 million years, assassin flies have ruled the world of insects as a top predator. The lineages of these ancient creatures, known for their ability to catch and prey upon nearly any other insect, were previously only studied in limestone fossils dating back to 112 million years. Details of the new discovery are published in the April 21 edition of American Museum Novitates. "The transparency of these amber fossils gives researchers a new window into the ecology of the Cretaceous period, and sheds light on the evolutionary history of a family of flies that has withstood the test of time for millions of years," said Dikow, a research scientist in the Department of Entomology. "The fossils of these ancient flies are so well preserved that you can almost imagine them flying around in our world today." The translucent amber fossils preserved the imprint of the new species—rather than the tissues themselves—and provided researchers with their first three-dimensional look at a fossilized assassin fly. Dikow identified the new species after studying the morphology of a male and female specimen using a microscope. 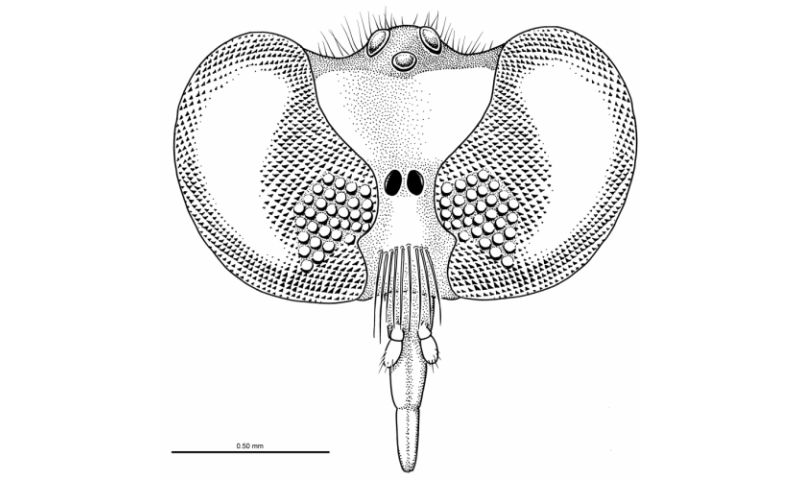 Distinct features that are not found in modern species of assassin flies include long, flattened antennae, a unique v-shaped eye structure and spiny hind legs. While contemporary species of assassin flies can reach a length of more than two inches, B. bruckschi was less than one inch long and had bristles covering its slender, piercing mouthparts. Assassin flies are named for their fierce predation strategy; they ambush and catch their prey in flight. Once caught, the flies puncture the armor-like skeleton of their prey, inject them with digestive fluids and extract the nutrients within. The female B. bruckschi contained small spines on its abdomen, leading Dikow to hypothesize that these insects are most closely related to other assassin-fly species that use these spines to dig and deposit their eggs in sandy environments. 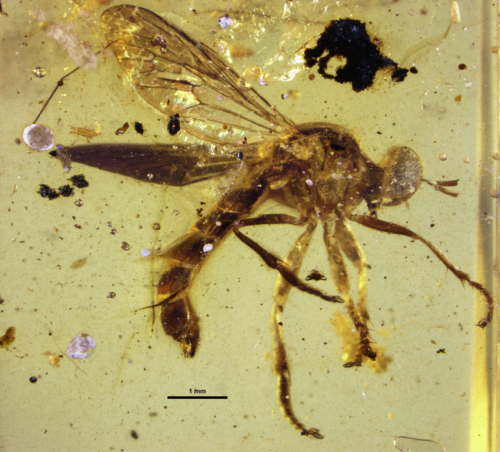 Since B. bruckschi likely did not spend much time in an arboreal habitat, it is extremely rare to find them in amber, the fossilized resin of ancient forests. Other fly species depend on forests for their life cycle and are therefore more frequently found encased in amber. Dikow co-authored this study with David Grimaldi, curator at the American Museum of Natural History in New York City. The team also named a second species of assassin fly in their research paper, Cretagaster raritanensis, which was originally discovered in New Jersey amber by Grimaldi in 1999.